Tesla enthusiast with passion for stats. 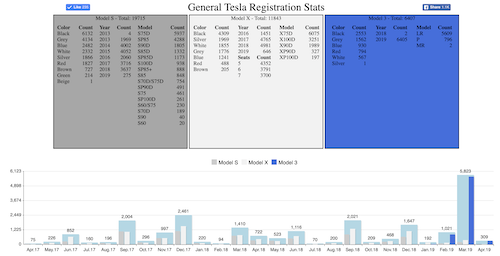 Created Teslastats while waiting for registration on my own Model XP90D Founder Edition. This page has grown bigger and bigger and now shows all models with registration dates, colours, badge, seats etc. Also created EV-Stats (Norwegian: Elbilstatistikk) where I display EV-registration in Norway for all brands and not just Tesla. In addition to these two pages I made a page showing stats for the referral program from Tesla and a page showing the current inventory in most countries. Speaking of the Referral Program. If you buy a new Model S, Model 3 or Model X, please consider using my referral, lasse9342.